Made from premium paper, these gorgeous black disposable coffee cups are perfect for serving coffee, cocoa, cider or any other hot drink. Say goodbye to separate cup sleeves and unnecessary waste in our landfills! 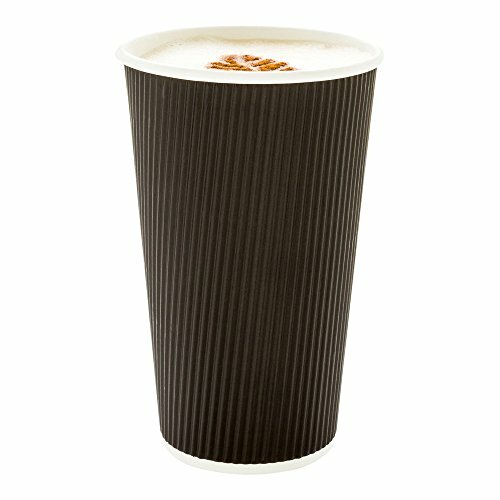 With its durable, ripple wall design - these recyclable coffee cups will keep beverages hot, but ensure the comfort of your customers' hands. Perfect for use at your café, catering event or party celebration. NO NEED FOR SEPARATE SLEEVES: These versatile, 16-oz black paper cups alleviate the need for separate sleeves, lessening your impact on the environment while saving you money in the bargain. KEEP THE HEAT IN: With the insulated, ripple-wall design, the beverage stays at a drinkable temperature while your customers' hands remain unscathed. ENSURE A STEADY SUPPLY: With 500 of these coffee, cider or tea cups in one package, you won't have to worry about running out anytime soon. MADE FOR RECYCLING: Constructed with 100% paper, these products can be recycled in a snap but still perfectly hold their shape while in use.